Zucchini and tomatoes take on Creole flavors with a dash of Creole seasoning and the Holy Trinity of Cajun (and Creole) cuisine, onion, celery, and bell pepper. This is an incredibly warm and comforting dish. The flavors come together perfectly, and the Parmesan cheese topping makes it even more flavorful and satisfying. I sauteed a cup of sliced mushrooms and added them along with the tomatoes. Add a teaspoon of basil, if you'd like. It's an extremely versatile dish! Fresh tomatoes may be used in the dish, but good quality canned diced tomatoes are just fine. Petite diced tomatoes or fire-roasted give the dish extra texture and flavor. The recipe makes a generous 6 to 8 servings, and leftovers may be frozen for another meal. Heat the vegetable oil in a deep, heavy skillet or large saucepan over medium-low heat. Add the chopped onion and diced celery and cook for about 3 to 4 minutes, stirring frequently. Add the bell pepper strips and garlic; continue cooking for 2 minutes. Slice the zucchini into 1/2-inch rounds. Add the zucchini, basil, butter, salt, pepper, sugar, and Worcestershire sauce to the sauteed vegetable mixture. Add the Tabasco sauce, if using. Increase the heat to medium and continue cooking for 4 minutes. Add the fresh or canned tomatoes and cook for 6 to 10 minutes longer. Taste and season with salt, as needed. Transfer the zucchini and tomatoes to a serving dish and sprinkle with Parmesan cheese, if desired. Or pass the Parmesan cheese at the table. Make this a main dish and serve it over rice. Top with the Parmesan cheese or a shredded cheese of your choice. 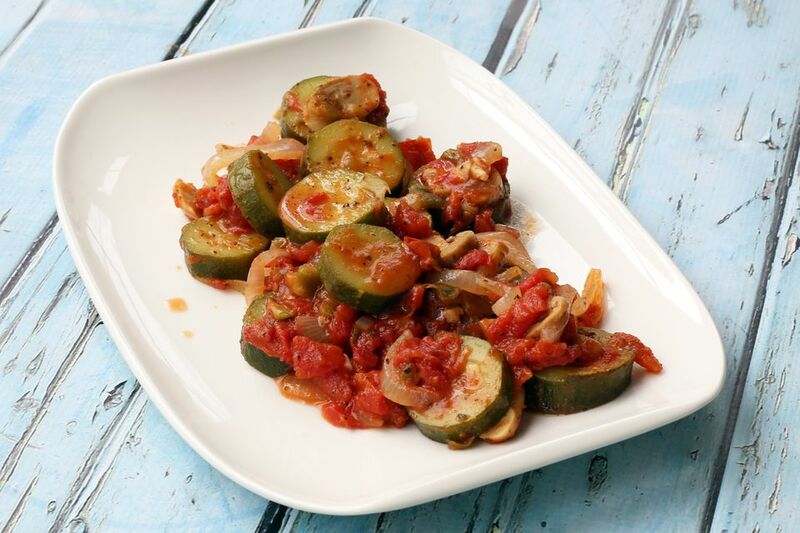 Ladle the zucchini and tomatoes onto plates and top with baked halibut fillets or baked or sauteed chicken breasts. To peel fresh tomatoes, cut a shallow "X" in the bottom of each tomato. Immerse them in boiling water and let them boil for 15 to 25 seconds. Lift them out and immediately immerse them in an ice and water bath. When the tomatoes are cool, starting at the "X," begin peeling the tomatoes. Cut the cores out, slice in half crosswise, and scoop out seeds. Chop and use in the recipe.